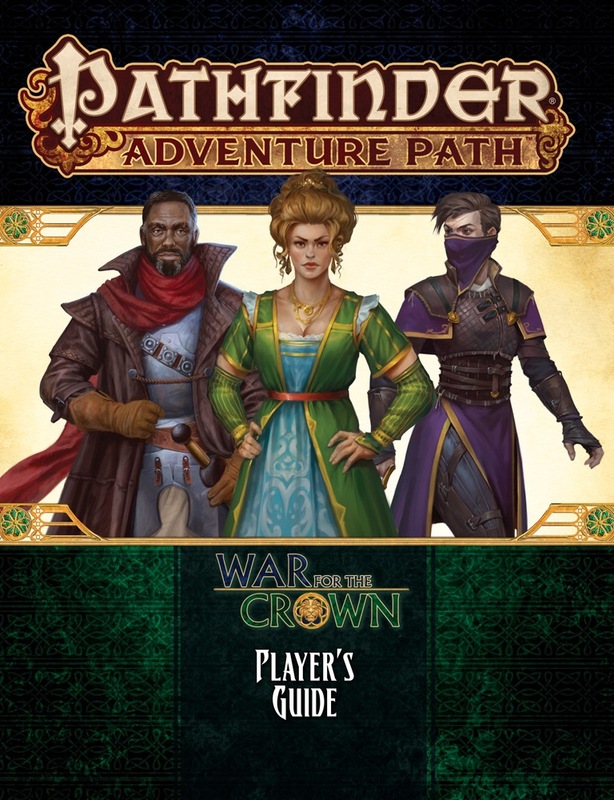 The War for the Crown Player's Guide provides players with all the spoiler-free information, inspiration, and new rules they'll need to create characters ready to read to dance, scheme, and backstab their way through the War for the Crown Adventure Path. Uh, am I the only one to think it's weird that this player's guide contains the full 2-page spread NPC codex entry for Eutropia, statblock and all, including text that reads like GM info? My game starts in 23 hours! couldn't come at a better time! Thanks for the Player's Guide. That said though, I find a little weird that Songbird, Scion, Saboteur makes it seem like the PC's are low-born, when the player's guide has two traits for noble PCs and two more mention minor nobility. One could even be a Stavian. What a wonderful Player's Guide, well worth the wait. Yeah, it's a little odd. But placing it here allows for two more pages in the AP proper, and it really doesn't give away much more than the rest of the Guide does. Since fighting her isn't going to come up (unless the campaign goes right off the rails), the player's seeing her stats shouldn't hurt. It's important for players to understand and have a conversation with the GM about Eutropia and her role. She's such an important part of the Adventure Path, players should know as much as possible to be invested in her. Surprised there's no mention of Amanandar. Senatorial Hopeful's best use seems like Wizard, Witch, Magus or Eldritch Scoundrel. There it can be used to inflate spells known (Constantly asking for new spells to study also makes more sense than constantly begging your family for A healing potion every week or some scrolls for a rainy day one at a time.). Any other consumable magic items worth less than the needed amount. Also I'm not sure it needed to specify it opens up to wands at level 10, given even level 0 can't be afforded till then and they're still consumable magic items. If you fancy being a bit on the evil side of alignment, you could spam requests for slaves. They cost only 50 GP for a household slave. Perfect for sending to check for traps. Slightly (slightly) less evil would be requesting animals to do the same thing. Can't think of anything within the price range it should be used on. Maybe an endless wardrobe, but that's pure RP. For the hell of it, I made a set of maneuvers for replacing the Swashbuckler levels in Eutropia's build with Bannerman Warlord ones (Because Swashbuckler is just terrible). I picked maneuvers on a basis of use in 1 on 1 dueling, avoiding ones that aid allies (unless they are useful on the user) or target multiple opponents. Replace Dodge (her AC is higher anyways) with Weapon Finesse. Optionally, replace Critical Focus with Improved Dirty Trick. Dastardly Gambit, Duelist's Gambit, Unbreakable Gambit. Tactics: Use Weeping Scarlet Razor to inflict bleed. Then use the counters and Combat Expertise while the bleed gives a mechanical meaning to "letting opponents tire themselves out". Use Dirty Trick to prevent them from full attacking, or use Greater Dirty Trick to stop them from attacking at all. Since fighting her isn't going to come up (unless the campaign goes right off the rails), the player's seeing her stats shouldn't hurt. This is probably how she'd react to the PCs fighting her. Thank you for the Player's Guide. Yay! Thankies War for the Crown team! Also I'm not sure it needed to specify it opens up to wands at level 10, given even level 0 can't be afforded till then and they're still consumable magic items. I haven't had a chance to read the guide yet, but is this possibly to avoid people asking for partially charged wands? That is a VERY nice map of Taldor in the Guide! 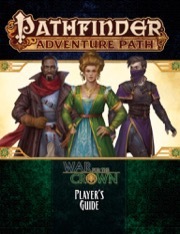 So glad to see this, and many thanks to Paizo's hard-working people! Is there any particular reason why the Rondelero Duelist archetype (IS Primer) was not included in the list of suggested archetypes (pp. 5-6)? Would it be because it's for a very martial class, with little to nothing in the way of social skills? Also: what about potential prestige classes? Would the players benefit from eventually taking levels in Ulfen Guard (IS Combat), Lion Blade (IS Intrigue), Enchanting Courtesan (IS Intrigue), and the like? Or would that get in the way of the AP's story-line? It's a lovely map, but shouldn't the various settlements be labelled? That would be a great help for players who are new to Golarion (or even just Taldor). Actually, all but one of the entries in the first book count Diplomacy as an influence skill check—and that one is the easiest to influence of the lot. Diplomacy is just never one of the bold skills, the ones used to discover the strengths and weaknesses of the individual. You misunderstood what I meant: Varima ability for Noble Scion allows you to roll Diplomacy two times and taking better result when using it to influence an area. None of areas in first book list Diplomacy as skill you can use to influence them. Varima's ability specifically calls out you can't use it to influence individuals. Well crap. You're right. Of course it will come into play in future adventures, but that is a lousy oversight. As GM, I would always allow Diplomacy as a default, but give it a penalty if not listed. There are a couple group-of-people Diplomacy checks in the Judging Crimes Event, so it can have a little use in SSS. And I agree: at least one influence/social combat encounter in each adventure would be terrific!